This week we’ve been inspired by The Financial Times’ article in How to Spend it about the radical reworking of weaving traditions. 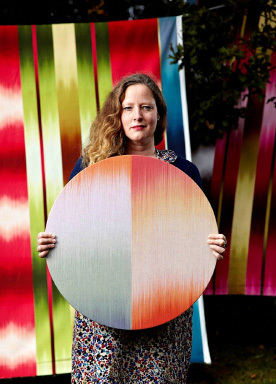 Since we work with textiles, we’re always excited to see how artists push textiles to new limits and create contemporary artworks from textile traditions. One artist who is left out is Gabriel Dawe who creates vibrant, humming structures from yarn. Dawe is originally from Mexico which might account for his love of vivid colour. His sculptural work is always site-specific, exploring the architecture of the space. He’s also interested in the connection between architecture and fashion, and how this can relate to the human need for shelter. We like how he attempts to subvert ideas about masculinity and gender construction - as a male artist working with thread; a so-called ‘women’s craft’ material. The images below show Dawe’s technique, he installs hooks on the walls, floor or ceiling and weaves sewing thread back and forth through eyelets. 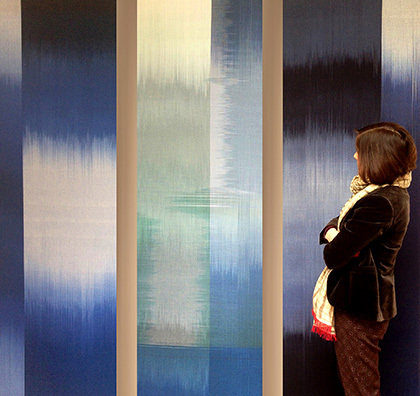 The FT looks at another an artist whose work we loved, Ptolemy Mann. Mann creates colourful and painterly work. 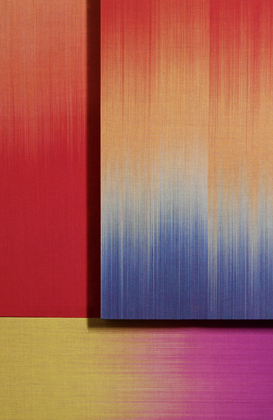 Her handwoven wall pieces are all made using hand-dyed thread, she builds chromatic bands which buzz and blend beautifully. Mann is passionate about colour theory which she says underpins her work - in the FT she says "Recently I've got bolder and more experimental with colour, allowing something unconsciously emotional to take place. I'm a fan of abstract expressionism. Mark Rothko is my favourite artist". Mann says she also has a Bauhaus philosophy of product and art making; an idea of uniting creativity and manufacture which the Bauhaus movement hoped would rejuvenate design for everyday life. 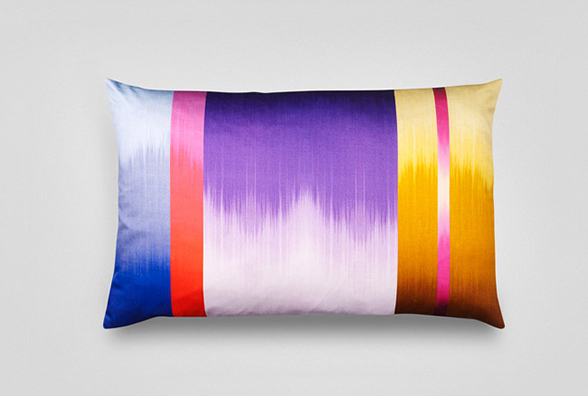 As well as her large scale pieces, Mann produces commercial furnishings including a range of fabrics, rugs, bed linen and cushions and we love that her work remains functional in this way. 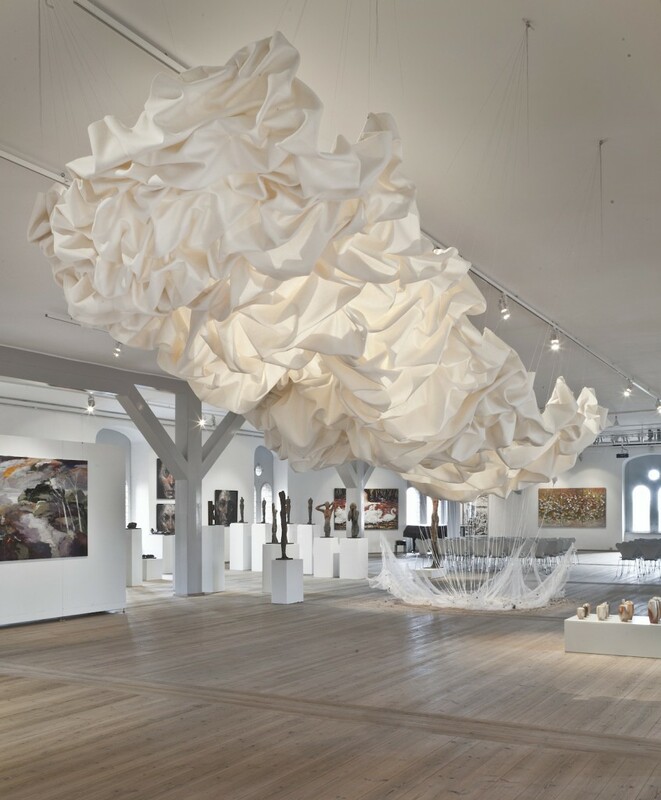 We were also intrigued by Cecilie Bendixen's 'Draped Nimbostratus' which represents a hybrid form of design - blending textiles, sculpture and architecture. It is made from wool and polyester and designed to absorb sound so that it disappears, creating a beautifully poetic, cloud-like piece.